The other day I was talking to two of my coworkers and we were comparing stories about hiring bad Santas during the holidays. We each had a story about hiring a Santa that disappointed the kids or was borderline inappropriate. Think Bad Santa the movie, but only half as bad as Billy Bob Thornton’s character. We had a good laugh, but it got me thinking, there is a real strategy behind how I hire Santa. I hire Santa every year for the annual Crafts for Christmas craft fair over Thanksgiving weekend. I work with the best Santa, but that hasn’t always been the case. The funniest aspect of hiring Santa is how many cold call sales pitches you get from people wanting to be Santa. I’ve had people drop by my office, try to sneak in, mail me cards constantly, and email me until I block them. It feels a little creepy to think you are being stalked by Santa, but I just think of it as part of my annual holiday season traditions. During the holiday season the good Santas are very busy. Now that the economy has improved there are a lot of companies bringing back Christmas parties and a lot of people having holiday parties at home. Everyone wants to experience the magic of Christmas, so there is a lot of demand for Santa. Book in advance and follow these tips and you will avoid hiring a Bad Santa. Request a picture of the applicant in his Santa suit. Look at the picture and see if the suit looks high quality and photographs well. Is this the type of Santa you would like to hire? Everyone has preferences when it comes to Santa, so ask for a picture so you can see if applicant Santa’s fashion matches your ideals. It is always a good idea to ask applicant Santa some questions about his experience and passion for the job. The best Santas will tell you they don’t play Santa, they are Santa. It is important because they stay in character. It is also important to consider applicant Santa’s personality and appeal. Does he look legitimate? Does he have charisma? Do you think children would like to interact with him? Do you think adults would like to interact with him? These are all important assessments when hiring Santa. If he seems creepy in any way or you sense any red flags, it is a deal breaker! Ask applicant Santa to tell you about some experiences they’ve had as Santa. The good Santas will have stories about happy and sad children, you know, the kids crying their eyes out sitting on Santa’s lap. Ask how applicant Santa interacts with kids. I always ask how they handle kids asking for expensive items. At my event a few weeks ago an 8-year-old asked for a very expensive gift. Santa responded perfectly by telling her he would try, but he never promised. He also didn’t rush the child and had a nice conversation letting her know that Santa would bring her something for being good. The child’s mother wrote us a letter thanking us because she couldn’t afford the expensive gift. She has been suffering financially. She said last year a bad Santa told her child he would bring the expensive gift and it was really hurtful to the child Christmas morning. Good Santas are delicate when it comes to dancing around requests. Get a National Background Check done each year. 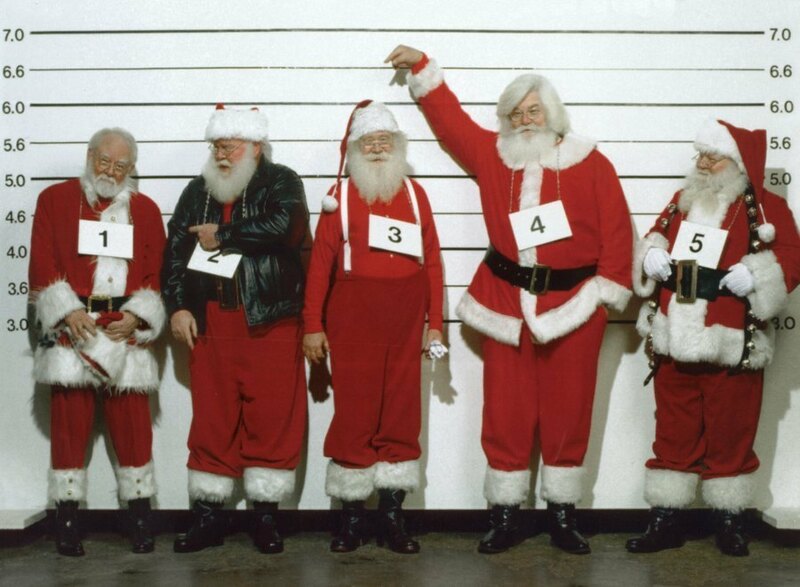 I’m lucky because the Santa I hire regularly is also the Santa for the FBI Christmas party. He can pass one heck of a background check. Background checks are important because they help you ensure the kids are protected and safe. A professional Santa will also have insurance to limit your liability. Always find out how much Santa charges. If you are hiring Santa for a long period of time don’t be afraid to ask if there is a discount. Make sure to ask if Santa does any other type of performances. Does he sing? Tell stories? Read letters? Applicant Santa should be a performer. Also ask how long the performances last or if there is a limit to how many hours Santa works. Are you the only client scheduled the day of your event or are their schedule conflicts? What if applicant Santa needs to stay over the contracted time? What is the charge for applicant Santa? Try to determine if the applicant seems easy going and flexible. Those skills are important for Santa. Ask for 3 references. If applicant Santa can’t provide at least 3 references he isn’t for you! Call the 3 references and ask for referrals about their experience with applicant Santa. If they aren’t practically jumping through the phone to tell you how great applicant Santa is, he may not be that great. I called one reference and she went on and on about how great the applicant was. She was crazy about him! In fact, all of the good Santa applicants I’ve worked with had ecstatic referrals. If applicant Santa is a good Santa there will be fantastic referrals. Every year right after Thanksgiving there is a mad rush for families to visit Santa. Make sure you hire applicant Santa before someone else snatches him up. If you can start the hiring process in January or February, that is outstanding, at the latest September. Visiting Santa is a wonderful family tradition, hopefully these tips will help you hire good applicant Santa and avoid Bad Santa. Have you had a memorable experience hiring Santa? Share your story in the comments.